Kathmandu: Kathmandu Upatyaka Khanepani Limited (KUKL), the Valley’s water utility, came under fire on Monday when consumers and stakeholders said the utility must increase the quantity and quality of drinking water supplied before it thinks of raising the tariffs of water usage. “If KUKL wants to increase the tariff, they must promise to supply enough drinking water with quality,” said Chirik Shova Tamrakar, a consumer. The two sides were also involved in a small quarrel at the public hearing programme on Monday, which was organised by Water Tariff Re-evaluation Commission (WTRC). 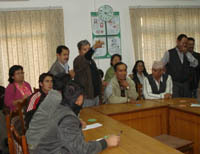 Some angry consumers led by Shakya Suren were involved in a verbal duel after officials tried to speak before consumers. “It’s a public hearing. Therefore, consumers should get a chance to speak. We are not here to listen to KUKL officials’ speech,” said Suren, who walked away from the programme with a few other consumers. 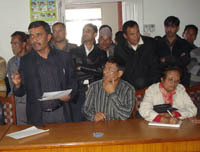 The public hearing was organised to discuss the proposed move by KUKL to raise water tariffs. The utility had last year proposed a hike in tariffs, which Water Tariff Fixation Committee had rejected. KUKL then asked for a reevaluation, following which WTRC, a high-level commission, was formed to deal with the issue. The commission conducted Monday’s public hearing as the initial phase of study. But consumers opposed any price hike, complaining that the utility’s services were just not good enough to justify the hike. According to KUKL, the Capital needs at least 130 million litres of water per day. “We are working on the Pre-Melamchi project that includes utilizing the Valley’s water resources, repairing leakages as well as finding other alternatives,” said Gautam.